Edenderry Town Pre Season Brought To a New Level!! 02 Aug Edenderry Town Pre Season Brought To a New Level!! A brilliant article penned by club PRO Alan Usher detailing the pre-season trip to the UK. Town Pre Season Brought To a New Level!! 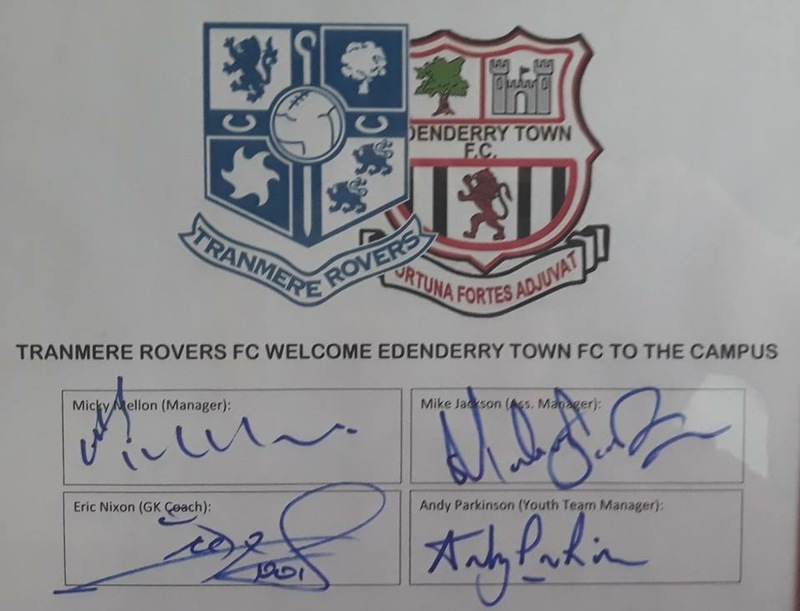 Following the club’s most successful season ever, Edenderry Town 1st team management and committee decided with the season ahead, the bar needed to be raised another notch in terms of preparation for Leinster Senior League Division 1. A plan was therefore put in place in partnership with DB Sports Tours to travel to the UK as the club had made some extremely good friendships over the years during under age trips across the water, so the contacts were aplenty. On this occasion it was the turn of the Senior squad to travel and get a taste of what it would be like to be a professional footballer for a couple of days. The ferry crossing was as smooth as the whole trip in general. On arrival on Friday evening the squad trained at Tranmere Rovers Campus Under 1st Team coach Shaun Garnett and goalkeeping coach Eric Nixon and for an hour and a half the squad was put through their paces at an extremely professional level, while overhead an unmanned aerial vehicle known to us all now as a “drone” recorded the entire training session, no doubt management will use the drills this season with all current players and those that sign for Edenderry Town. The purpose of this trip was not just albeit very important, a bonding session for the players but also a chance for Management and committee to take home the so many professional ideas and implement them into the clubhouse and grounds of Paddy Maloney Park. The session was tough, maybe a bit too tough in hindsight as the lads after a long day traveling had to surface the next day to face Championship side Wigan Athletic with a 10.30 am kick-off, who are already in the process of getting in tip top shape for their opening game of the season on Saturday v Sheffield Wednesday. Wigan recently purchased Bolton Wanderers training Campus for a price of £2M, with pitch surfaces in comparison to centre court at Wimbledon and with the sprinklers on it was the first introduction the lads from Edenderry got to what it’s like to play at this level on Saturday morning last. Wigan Manager Paul Cook addressed the players both before and after the game and gave them every bit of encouragement as amateur players of how well they done and particularly their second half performance. The former Everton and England International Peter Reid was present and is now a consultant to Paul Cook and he was also very complimentary of Edenderry Town. Town went a goal down early, a cracker it was from full back and first team regular Tyler Golden, three goals followed as Town made some schoolboy errors, however Eddie Mc Donald in the town goals was always going to be busy and managed to make some outstanding saves against a side that showed exhilarating pace, fitness and finishing as one would expect with regulars in their side very much trying to impress and justify the £200\£300,000 price tags. Devante Cole(son of Andy Cole) ,Jensen Weir (son of David Weir) to name bit a few of at least six first team regulars all played on Saturday morning. In the second half town were far more relaxed and turned in a much better performance in terms of keeping the ball and showing greater awareness all over the Park. Apart from an injury time goal which was frustrating, town created a couple of half chances with Peter Mc Namara and Liam Donnelly going close. The game finished and town had conceded five to a club that will have English Premiership aspirations over the coming seasons ahead, but this was never about the result. The town squad of players, many only tasting their first time involvement with the squad, as for work reasons, injuries and holiday commitments, Town travelled without half a dozen regulars, this was a truly amazing experience and the hospitality shown after the game as players were given a tour of the campus followed by an invitation to dine with the players, it was a most memorable trip with thanks to both Tranmere Rovers FC and Wigan Athletic FC from all the players, management team of Tom Glynn, Ray Pender, Ian Mc Guinness, supporters and committee members. Back Down to earth now for the lads as the real business starts soon as the Leinster Senior League Division looms large in the coming weeks. The squad were complimented by both clubs for their professionalism, behaviour and respect shown by them at all times to their hosts. Well done to all involved.